Faculty members Schreibman and DeNove honed their craft working on 1986 "redneck expoilitation thriller" "Hunter's Blood"
A screening of the 1986 thriller “Hunter’s Blood” at LA's adventurous New Beverly Cinema, as part of a triple feature of genre films with a solid fan base, has turned into an impromptu reunion event for crew members — whose ranks include two TFT faculty members. The film’s producer was professor Myrl A. Schreibman, head of the highly successful UCLA Arts Camp/Workshops program, while Tom DeNove, Vice Chair, Department of Film, Television and Digital Media, served as Director of Photography. Described by one online source as a "surprisingly engaging redneck exploitation thriller with heavy slasher overtones," the film is a post-"Deliverance" B-movie in which a group of urban yuppies on a hunting and fishing expedition, led by Sam Bottoms and Kim Delaney, are stalked across the Southern swamplands by a pack of "psycho hillbillies" that includes a young Billy Bob Thornton. "It's crisply paced, with a nice selection of off-the-wall lead and supporting characters," continued the online admirer. "Throw in a fetching, pre-"NYPD Blue" Kim Delaney and a solid, macho heroic turn by Clu Gulager, and you’ve got enough cheese to flavor your popcorn." 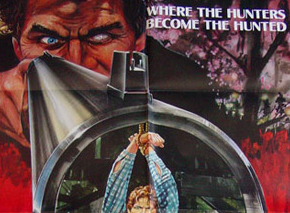 Gulager, who will appear in person at the event, along with Schreibman and DeNove, stars in all three of the films being screened on Saturday, a line-up that also includes the Freddie Kruger sequel "A Nightmare on Elm Street Part 2" (1985) and the serial killer sleeper "Terror at London Bridge" (1985), starring Adrienne Barbeau and David Hasselhoff.